i have been inundated with requests to provide more unsolicited reading material for your empty screens. what you need, what the world needs, is my blog of new writings to delight, to entertain, or to appall. i know you are busy and i am busy too, creating a new novel (to be published this century) and yet another non-fiction work, a miscellany of human mirth and misery (to be published in the same century). because we are all busy people, i propose to save time by using lower case only. punctuation and grammar will generally be preserved; it takes more time and effort to avoid them than to include them; good habits die hard. the blog will include stories, the occasional thoughts, snippets of work in progress and some old unpublished material of which i have a high opinion. the blog will be conducted by my blog-bully, my daughter, who wants a story a week. i’ll resist the bully and post a blog when i think i have something worth reading. p.s. the mark of a mature writer is one who has gone beyond enjoying polite applause. i am not too mature for polite applause. Howard, good to know that you are safe and in good shape. what sort of doctor are you, allan? or worse – in 1967, when we were roommates? I worked in the same building as you and remember seeing you arrive in your colourful runing gear or see you outside the premisses, waiting for somebody, and your eading some material–never a wasted moment. I was lucky to get you once when I attended the pracice and as it was a simple procedure you had to do on me you engaged me in conversation. You listened to my opinions and knoing that I was in the presence of an intellegent person, made me feel very worthy. I am currently reading ‘Raft’, and I love it and mostly relate to your experiences. I found your book in a library last week. You have captured the reality of working in the outback as a medic. 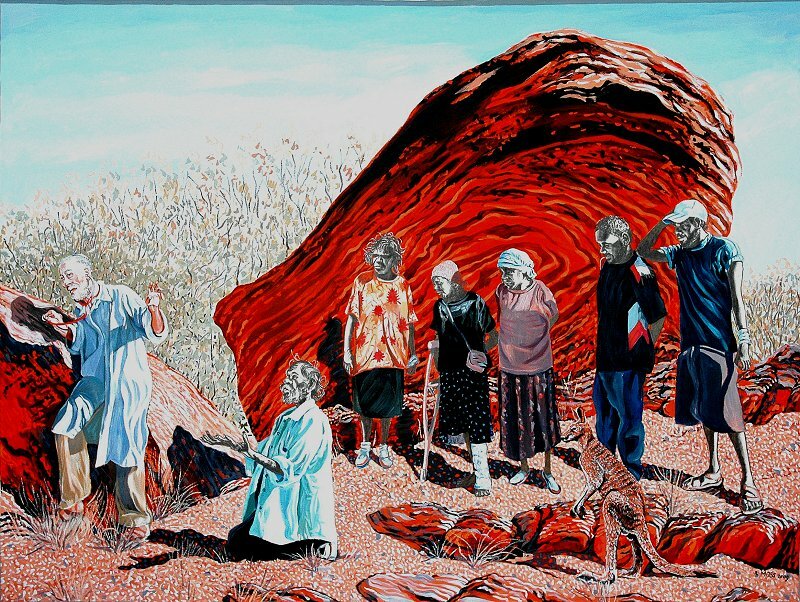 I have also worked in the Kimberely in communities and throughout W.A as a nurse and this year I have experienced the N.T. I go back every year, because I too have so much interest of our Indigenous communities and the issues. I have been writing a fictional novel since 2010 inclusive of my outback experiences as a nurse. It is almost completed and ready to be exposed to the big bad world. I hope. I admire everything you have shared with the world in your book. I also live in Melbourne and nurse. When I burn out here, I go outback, when I burn out there, I come home. One funny man! You were my GP for a couple of years while I lived in Melbourne and in 2002 you saved my life! I was looking up some details for another doctor and your name came to mind so I googled you to see if I could find what you are up to now. It looks like you are having a great time, having great experiences and making a difference- which is what really counts. I have just read your article on Wadeye in the Weekend Fin. You are an amazing writer, a compassionate commentator and and eagle eyed observer. Why have I never heard of you before? In a world of too few heroes commentaries like this should be obligatory reading for all. The other night I was telling somebody about Manny Olian, and afterwards decided to Google him for the first time in 50 years. The only result was your piece “The Reunion”, 11 November 2013. Like Manny, I started Architecture at Melbourne Uni in 1964. I did not know him well, but no-one in the year could fail to be aware of him. With his shoulder length hair he was unique; I had never before seen any male who looked like that. Of course in a few years many of us had long hair and beards, but he was a pioneer. I believe he was a very good pianist as well, and he was, as you suggested, somewhat distanced from the rest of us as a result of drug-taking. I have enjoyed reading some writings in your blog – your heart is obviously in the right place in these troubling times. I found your picture on one of your pages, and no, I don’t think we have met personally. However I have played for many orthodox weddings and barmis in ‘Schnapps’, so you might know me at a distance. I’m an old friend/student (from 2007-2008). I’ve been looking for phone number for medical clinics so I might be able to contact you and re-connect, although since I’ve found your wonderful blog I wonder whether you are now focussing your energies on writing rather than practicing medicine.. do you have a phone number or email address I can contact you at? My email address is katherine.knight@rocketmail.com, perhaps you could email me and I’ll explain all! You were such a huge part of mine and my families life for such a long time….you were there at my darkest times and my happiest times. You saw my babies into the world and now one of them has babies….you are very loved and missed. You were my yard stick of what a doctor and human was meant to be and sadly no one has ever compared….therefore you have never been replaced. It is really pleasing to see you are well and driven by passion in a different form….writing & communication. Totally independently from my sisters comments last year , I found myself googling my life. Reading about DC and remembering the tiny town of the 60s and the lasting memory of Dr Don Cordner examination of my appendicitis and then his fresh face apprentice Howard Goldenberg. I sit here in the UK after many years residence with my wife Mandy, yes the same English nurse from Greensborough Hospital. After so many years we still refer to our wonderful doctor and friend and so many even the UK NHS has heard of the famous Howard “G”. Healing is an amazing thing, after 40+ years your contribution to our lives and the smiling recollection of your place in our life has a strangely reassuring effect. Having the love of so many and distant people is a awesome statement of your personality and contribution to the world. I remember the cunninghams of DC! And I remember mark – such a handsome youth! Do you and Mandy have kids, grandkids? We returned to UK in 1994 and Mandy is still a nurse and I have been successfully working in London. If you ever find your self sitting on a park bench in London passing time please stay in touch email we would love to see you. Hello, old (only a little older, maybe) friend. I just found your site and my eyes lit up. Pam, the girls and I hope that all’s well for you and yours. Still the best GP Diamond Creek ever had. I dips me lid to you. God’s blessings to you, to Annette and the family. I well remember my many visits to see you professionally. You were my GP. I live overseas now, but still think highly of you. I recommend you the others, but see you aren’t practicising anymore. This was about 8 years ago; I still immediately think to mention you whenever someone asks for a rec in Melbourne. I’ll be sad at the reality of finding a less genuine, caring and intelligent Doctor when I move back to Australia.